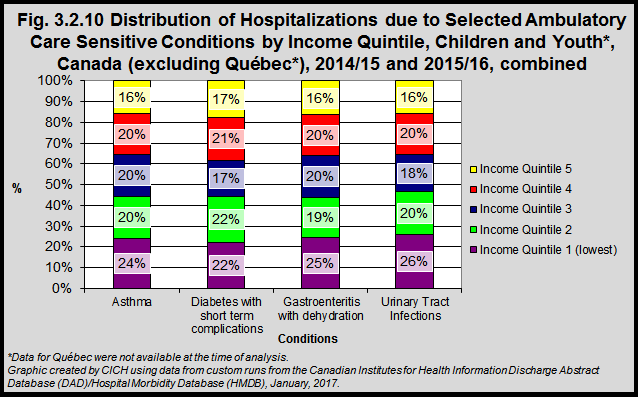 Children living in the lowest income neighbourhoods (Income Quintile 1) are somewhat more likely to be hospitalized for both chronic (asthma and diabetes) and acute (gastroenteritis and urinary tract infections) ambulatory care sensitive conditions than are children in higher income families. Approximately one-quarter of all hospitalizations due to asthma, gastroenteritis with dehydration and urinary tract infections (UTIs) are among children in income quintile 1. 24.2% of all asthma hospitalizations among children and youth age 2 to 17 years are among children in the poorest families – compared with 15.9% of the hospitalizations occurring among children in the richest families. 22.4% of all hospitalizations due to diabetes with short term complications among children and youth age 6 to 17 years are among children in the poorest families – compared with 17.4% among children in the richest families. 24.6% of all hospitalizations due to gastroenteritis with dehydration among children and youth age 3 months to 17 years are among children in the poorest families – compared with 16.3% among children in the richest families. 26.2% of all hospitalizations due to urinary tract infections among children and youth age 3 months to 17 years are among children in the poorest families – compared with 15.6% among children in the richest families.